I should have posted this sooner, but time got away from me so I am posting. Last Friday was my dad's 58th birthday! My step-mother asked me to make a cake for dad's birthday because he likes cake..scratch that he LOVES cake. It took me a minute to figure out the design on the cake because unlike most people, my father is really simple person. He wears almost the same thing every day (jeans and a black t-shirt) which I call his uniform lol. He used to do construction before he hurt his back, so I guess it was just easier to throw on jean and t-shirt than mess up nice clothes. Why black?? I have no idea but he has like 20 black t-shirts. So because he is so plain and simple, I knew he wouldn't like an over the top cake like most people would so I had to really sit down and think. Then it hit me why not to a cake with tools on it since he loves to build so much. My step mom gave me the flavor, chocolate mint cake so that was already taken care of. Thank goodness too because I would have completely lost as to the flavor since I offer so many. I made the cake red and black (since I know he likes black), the colors together. I then had to figure out what tools to put on the cake since as a contractor, he has worked with all kinds of tools. I decided in then end to keep it simple, a hammer, flat head screwdrivers, a pair of pliers and a ruler; things almost every contractor would have in his toolbox. I was busy with other cakes, so my step mom came and picked it up for me. She texted me later to let me know how much he loved it. I was so happy cause you never know with my father either he likes it or he doesn't. So I am glad he liked it. I'm trying to keep my posts short and sweet. So there will be more posts during the week but they will be shorter only one or 2 cakes per post. Next post will be about my newest baking find! I made this cute baby Cookie Monster and Cookie Jar for mom in Maryland who is having a Milk N Cookies Party for her son. I think the theme is so cute and can be done in many different ways depending on if its for a birthday party or baby shower. Not only did I do cookie monster, I made all the decorations for the cake and then because I was so inspired by the theme, I also made some cupcake toppers that are now available in my Etsy shop. Here are some pictures of what I have available now in the shop. 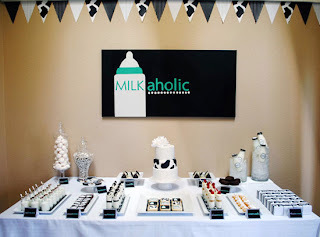 For those of you who might want to do this theme for your little one's next birthday party or baby shower, here are some pictures from event planners/parties of the Milk N Cookie theme for inspiration. This party is Milk N Cookie party is from AParty Style. This blog post is wonderful in that she takes you through the party and how she styled it (plenty of pictures) but also breakdowns all of the party details! The next party is from A to Zebra Celebration under a featured blog post. Its a Vintage Milk N Cookie Party for a little girl. I love the color scheme and shows you how you can take your color scheme and make it fit the party. 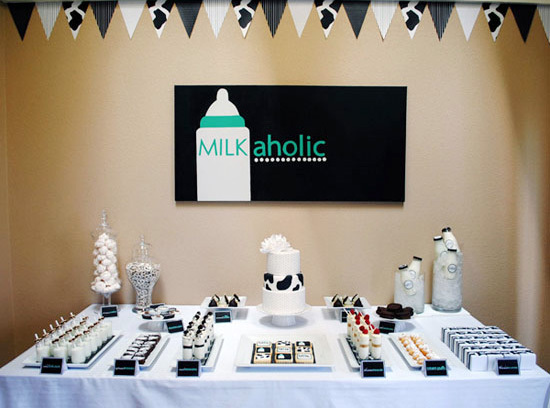 This last party was pretty cute:) It is a coed Sip & See Milkaholic Baby Shower by Half Baked. For those of you who don't know what a Sip & See is, it is shower that is held after the baby is born. It is mostly a Southern tradition where people get together to "see" the newborn baby. This is the cake that is on the above dessert table. This shows how the cake can be fun and classy at the same time. 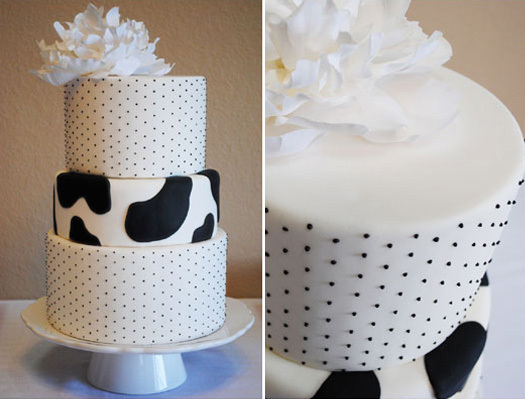 The cow print ties back into the theme while the flower and dots brings a level of sophistication to the cake.